Sens. Jeanette White, left, and Alison Clarkson. 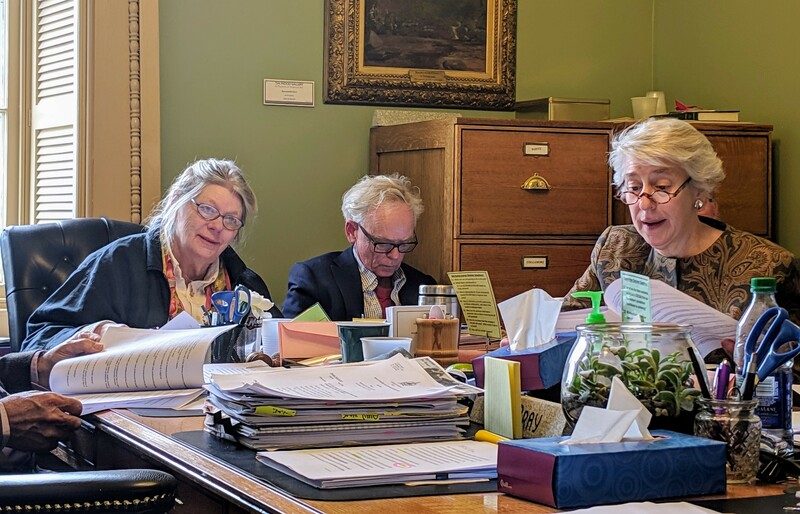 After Sen. Alison Clarkson (D-Windsor) on Thursday pitched her colleagues on legislation designed to protect tenants in Vermont’s 78,000 rental units, two senators argued against it — not on the grounds that the bill would hurt the economy or be ineffective, but because it would affect their personal finances. The bill, S.163, includes the creation of a statewide database of all rental units, state funding for a new Department of Health staffer to oversee rental housing conditions and a requirement that residential building contractors register with the state in order to reduce home improvement fraud. Clarkson described it as a consumer protection bill. Sen. Jeanette White (D-Windham) objected to some of the policies. She said a statewide list of rental units would include an apartment in her home that she rents out. Sen. John Rodgers (D-Essex/Orleans), a building contractor, piled on. He said the state already imposes onerous restrictions on him and other contractors, and another would be unfair. “I see no protections for the contractors” in the bill, Rodgers said during Thursday's debate. While both White and Rodgers openly spoke about their personal stakes in the outcome of the bill, neither they nor any other member of the Senate suggested that they might face a conflict of interest. Nor did they state an intent to recuse themselves from voting on the bill. White and Rodgers aren't the only ones with skin in the game. According to ethics disclosure forms filed earlier this year and available in a Seven Days database, 12 of the Senate's 30 members make at least $10,000 a year from rental properties or real estate companies. In an interview following Thursday's debate, White argued that there's nothing wrong with a senator voting on an issue in which he or she has a personal interest. White noted that in Vermont's citizen legislature, lawmakers often weigh in on bills that affect their nonlegislative professions. "Everything that we do is a conflict of interest," she said. Lawmakers, she argued, are only conflicted when a proposal "would impact you more than anyone in that class of people." The Senate rules don't specifically state that, but the body is also subject to the rules in Mason's Manual of Legislative Procedure. Questioned about her intent to vote on the bill, White led a reporter to her Senate desk and pulled out a copy of Mason's Manual, flipping to a page marked by a sticky note. She pointed to an underlined passage. "The right of members to represent their constituencies is of such major importance that members should be barred from voting on matters of direct personal interest only in clear cases when the matter is particularly personal," the manual reads. "Obviously, this rule is not self-enforcing," the manual states. According to those rules, White said, there's no problem with her or the Senate's other 11 landlords voting on the bill. "This doesn't impact me any more than it impacts any other landlord in the state," she said. White said the same applies to Rodgers, who wouldn't be any more affected by the proposal than other Vermont contractors. Clarkson opted to delay a final vote on the bill Thursday, giving senators more time to consider it, suggest changes and, perhaps, decide whether to recuse themselves.